I thought of her a while back when a neighbor brought me a beautiful bag of stone ground cornmeal. It was a bright yellow and rough to the touch. I was peering out the window and reached up to touch the rosemary plant sitting there and it released a spicy fragrance, so I decided to take Ronnie Lundy up on her statement. I make cornbread three times a week, but this cornmeal need something extra, something those lunch ladies could only dream of. 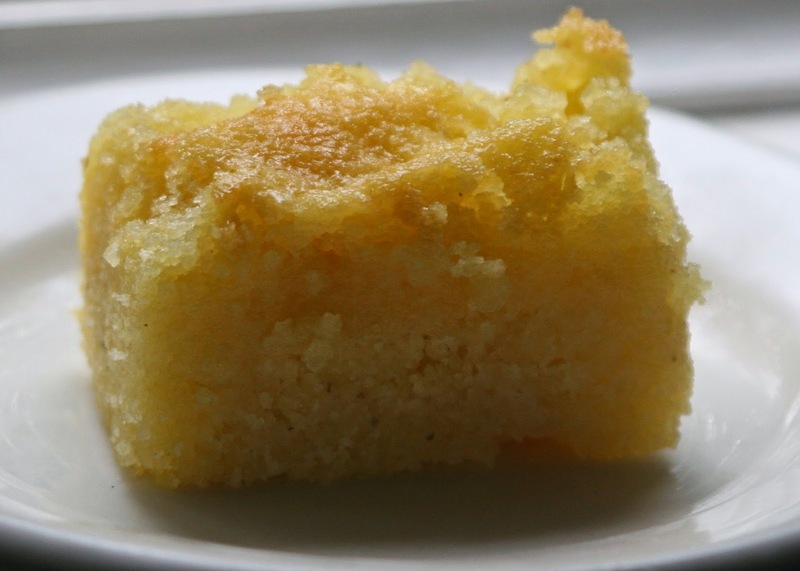 With just a bit of sugar, that cornmeal might make a fine cake. Instead of some sort of frosting, I thought the rosemary; steeped in a sugar syrup and some lemon zest would make a nice counterpoint. This is not a recipe I dreamed up, exactly. Ask Ronnie Lundy; it’s a sweet, cornbread with extra milk and syrup on top. There are a lot of recipes like this on the web, in fact many of them are identical, only the name of the chef is different. I baked this in my Lucinda’s Wood Cake Box. 1. Preheat the oven to 300F. 2. Line the box with parchment paper and spray with cooking oil, like PAM. 3. Place the dry ingredients in a large bowl. Whisk the cornmeal, flour, baking powder, baking soda, salt, and sugar several times with a whisk to blend them. 4. In another bowl mix the honey, buttermilk, oil, and eggs until just blended. 5. Add the wet ingredients to the dry ingredients and mix until smooth. 6. Pour into prepared cake box. Bake for 90 minutes. 7. While the cake is baking, combine the sugar, water and lemon juice and bring to simmer, stirring to insure the sugar is dissolved, about five minutes. Remove from the heat and add the bruised rosemary, letting it steep until cool, about 30 minutes. When the syrup is cool, strain out the rosemary. Add the lemon zest to the strained syrup and set aside. 8. While the cake is still warm and in the box, pour the lemon, rosemary syrup over the cake. Allow the cake to cool another 30 minutes before serving. This is an easy cake that requires very little fuss. Make the syrup from thyme, mint or maple and bourbon. Dress it up with some berries or a whipped cream. it can go from after school snack to elegant dinner with little trouble. How Do You Move A Library?